The 2014 Major League Soccer season is heading into its final stretch at the regular season is coming to a close. Teams in the playoff race will now look to improve in the standings to get more favorable matches in the postseason as teams that still have not been eliminated from postseason contention look to sneak in. The top games on the secondary market this week feature some interesting games between the Eastern and Western Conference. Here are the top 5 MLS tickets of the week. There will be a crucial game between Western Conference teams fighting for playoff contention as the Portland Timbers host the Vancouver Whitecaps at Providence Park on September 20. The defending Western Conference Champion Timbers got off to a very slow start this year but still have a chance with their great attack as they take on a Vancouver team that are struggling to find offense. Portland Timbers tickets versus the Whitecaps have a current average price of $75.94 on the secondary market with a get-in price of $55. Interesting East Vs West Matchup coming up this weekend as the New York Red Bulls will host the Seattle Sounders at the Red Bull Arena on September 20. The Sounders are having a historical season and are just three wins away for a 20 win season making Seattle just the second team in MLS history to do that. 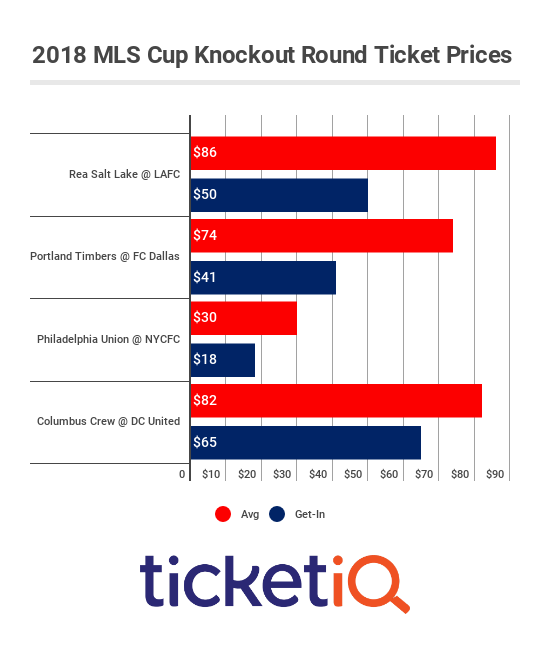 NY Red Bulls tickets versus the Sounders have a current average price of $66.06 with a get-in price of $22 as tickets are now down 9% in the secondary market. The LA Galaxy were red hot winning five in a row, but are now coming off two draws as they host FC Dallas at the StubHub Center this Saturday. Dallas is coming off a win over Whitecaps and have been a top team in the Western Conference throughout the season. LA Galaxy tickets for this game have a current average price of $58.51 with a get in price of $23. Another top MLS game this week features the Seattle Sounders as they take on a Eastern Conference opponent the Philadelphia Union on September 16 at PPL Park. Philadelphia Union tickets versus the Sounders have a current average price of $50.53 on the secondary market with a get in price of $26 as tickets are now down 12% in the secondary market. The cheapest top MLS ticket this week features an East vs West matchup between the Chivas USA and Toronto FC on September 21 at BMO Field. Toronto FC tickets for this game have an average price of $46 on the secondary market with a get-in price of $18.